Belson Outdoors Pig Roast Manual | BARBECUING FOR PROFIT! Roasting meat over an open fire is the oldest method of cooking known to man. There is just something uniquely primitive about the sights and aromas of a whole animal slow roasting over a fire that people can?t help but enjoy. Whether you?re intending to feed hundreds of people at a catered event or just having a family cookout in the backyard, barbecue style cooking creates a lively, social atmosphere that has made outdoor cooking one of the most popular choices across all generations. Grill, rotisserie or roast?outdoor dining always adds a tasty new dimension to every party. While there are many different techniques to outdoor cooking, this particular article focuses on the best ways to roast a pig. In the catering and restaurant business, the question of how to efficiently and tastefully feed a sizable crowd is one that often arises. Not nearly enough, however, is the answer ?have a pig roast!? The task of roasting a pig may seem daunting at first, but in actuality the preparation is minimal, it's sure to satisfy and entertain a large number of guests and the clean up is easy! In addition to covering all the information you will need from preparation to carving, we've also included our favorite pig roast marinade and sauce recipes. 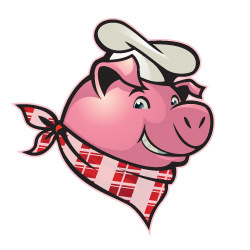 The goal is to share our ideas with your restaurant or catering business to help make your pig roast not only a success, but an event that will be talked about for years to come. The knowledge and tips shared within this pig roast manual come from years of experience using the Belson PORTA-GRILL® pig roaster, and assume you are using a Belson spit basket rotisserie with drip pan. The Belson spit basket effectively prevents the meat from falling off the spit, so there is no need to wrap the pig with that troublesome chicken wire that is so often used (and dreaded). Break ahead of the competition with a mobile unit that?s versatile enough to go from backyard cookouts to small scale catering events while still having the capacity to serve thousands of hungry people at outdoor festivals. The ROTO-BQ offers an excellent low-cost method to produce large quantities of excellent barbecue. The consistent temperature and steady rotisserie rotation ensure that meat will cook evenly ensuring a uniform color and flavor. The unit is available in four different models: with skewers, trays, half-chicken baskets or a spit basket. All rotisserie attachments work in conjunction with all PORTA-GRILL® models: propane, charcoal or mesquite. Each package includes a cabinet, a drip pan, and a 110V, 4RPM power pack.